After a visit to Buddha’s birthplace in Sarnath, another plane ride, a night in Delhi and a five-hour car ride(don’t worry I told off the tour guide and now we have fully upgraded to an suv with ac, room for luggage and shock absorbers), we arrived at our destination…The City of Agra and the sight of the Taj Mahal. We entered from the Northern Gate into a walled garden, which was an impressive sight in its own right. As we moved about the garden, we crossed a gate and entered a world similar to Dorothy being dropped into Oz in the Wizard of Oz. The Taj stood like a mirage in a desert with an ever so slight haze surrounding its marble surface and to my surprise one of the most magnificent monuments I’ve ever seen. There are 30,000 people from all over the world who visit the Taj each day. The Mughal Emperor Shah Jahan built the Taj in memory of his third wife Mumtz Mahal, a Muslim Persian princess, who died giving birth to their 14th child. Indians consider it one of the greatest love stories in their history. Shah Jahan was so saddened by his wife’s death that he called upon architects and artisans to create a lasting memorial in her honor. Next to the Taj is also a Mosque still in use by Muslims today. There is an exact replica of the Mosque on the other side of the Taj but since it is not facing Mecca it is simply another beautiful copy. The Taj is considered an architectural jewel in the Muslim world and a 7th wonder of the world. It was built in 1631 and completed in 1653 and cost approximately $68,000 USD (think 360 years ago). 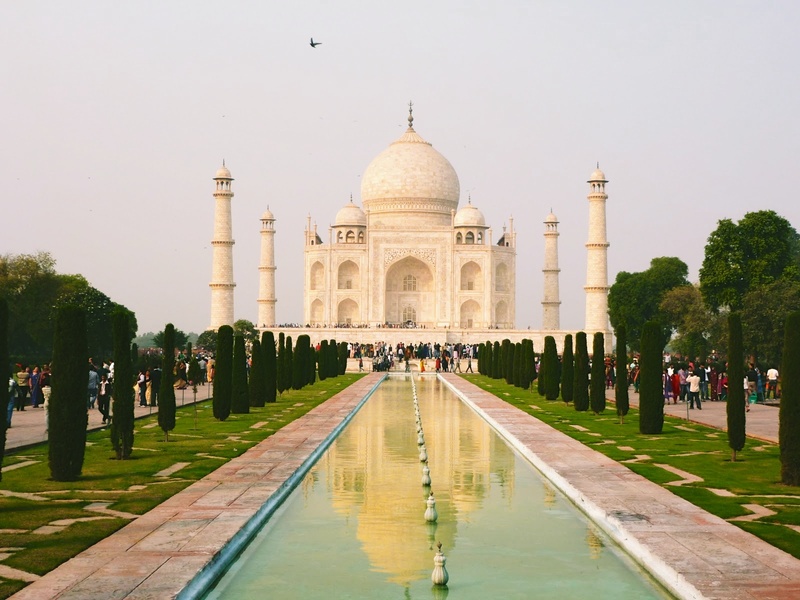 A total of 20,000 people worked on the construction of the Taj. During the Indian rebellion in 1857, British soldiers defaced the Taj and looted many of the precious gems from its walls. The British later restored it in 1908. The Arabs came to India in the 9th Century looking for spices and silk and riches but the Sultan did not invade until the 11th Century. There were 500 separate kingdoms in India (India and Pakistan were one at this time), which made India an easy target for invasion. There were six great Mughals (Mongolian Muslims) who ruled India from the years 1526 – 1857 with the golden period peaking during the Shah Jahan’s rule and waning in 1707. The Mughals are said to be direct descendants of Genghis Khan. The Shah Jahan was the fifth in line of such great rulers. I have lots more funny stories to share about Hindu gods and Buddhism but I wanted to give my perspective on seeing the Taj up close. It’s not simply the size of the monument that took me by surprise but rather the architecture and the detail of each stone. Similar to the awe of the pyramids, setting eyes on the Taj left me feeling thankful. Hoards of people were pushing for the perfect picture and I was trying hard to memorize the pictures in my head of the Islamic hymns carved on the archways, the red colored stoned monuments decorating the surrounding entrances, the reflecting pool giving way to a masterpiece and more importantly a functioning piece of art that symbolizes history, power, religion, destruction and love.